Filling the skills gap is a well-known benefit of hiring foreign nationals. But international workers contribute more than their education and skill set – their unique perspectives can offer the companies they work for a competitive advantage in the global market. In fact, McKinsey & Company showed in its January 2015 study that companies with racial and ethnic diversity measuring in the top quartile are 30 percent more likely to have better financial returns, and 35 percent more likely to outperform their non-diverse peers. In the war for talent, “diversity” can’t be a throwaway term or an afterthought – it’s how companies are separating themselves from the pack. High-revenue companies are already changing their recruiting practices. According to The Diversity and Inclusion Benchmarking Report, 44 percent of Fortune 500 companies invest in workforce diversity for the innovative and agile mindsets those workers bring. The report also revealed that 33 percent of the Fortune 500 respondents said diverse teams allow the organization to serve their customers better. That’s especially true at Envoy, where the company’s immigration management platform is designed to serve international workers. Chief Product and Technology Officer Sairam Rangachari navigated the immigration process as a foreign student and later as an H-1B employee, and his experience enables the company to create a technology platform that a diverse customer base will benefit from. “Having [a foreign national] in an executive position working to benefit our long-term growth is awesome,” Sciolla says of Rangachari. Foreign nationals have a lot at stake when they enter the U.S. workforce. That motivation directly translates to the hard work and desire for personal growth they display in the workplace. “We see those kinds of entrepreneur immigrants, you place them somewhere in a business, the next thing you know they navigate the system and go ahead open their own business,” says Djimet Dogo, head of employment services of Immigrant and Refugee Community Organization, a state-funded organization that helps immigrants become self-sufficient in their new homes. Dogo secures employment for new immigrants of all education levels, from farm workers to high-skilled engineers. Even though the experience and education level of the international workers he encounters differs, one thing remains the same — their hard-working mentality. “[Foreign nationals] are going to do business and come back and educate their community members about the business investment,” he says. This practice of sharing resources is commonplace, since these individuals often have limited access to select services, such as real estate investment and health insurance, in their home countries. 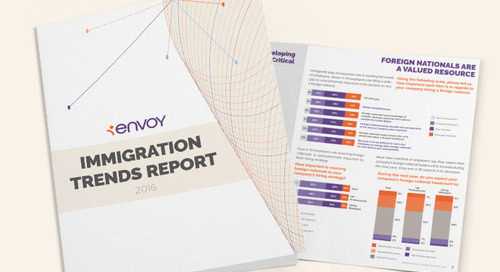 The post How Foreign Nationals Unlock Greater ROI appeared first on Envoy.